The new products we get to introduce you to today, are just plain sweet! Like to cook or bake? 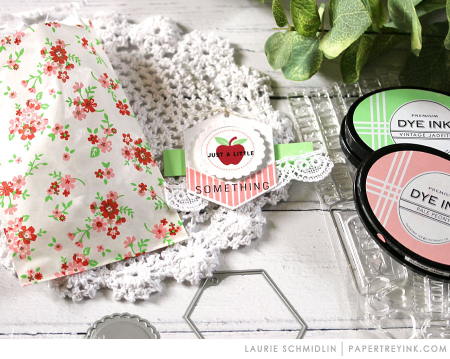 Give out delicious homemade treats with darling handmade packaging? Create your own super cute gift tags? We've got you covered! Keep reading to see some fabulous stamps and dies that are going to make all of that even more fun! If you’re someone who spreads love with gifts from the kitchen, Too Hot To Handle is just the set for you to package up your homemade goodies in style! Create cards, tags, and even recipe cards with this selection of culinary essentials. The solid oven mitts are perfect for quick projects while the open images are ideal for paper piecing or coloring with your favorite medium. And these images even coordinate with the Bowl Of Sunshine and Second Helping Of Sunshine sets to open even more avenues of creativity. You’re sure to enjoy whipping up an artistic masterpiece with Too Hot To Handle! Use these fun and festive stamps in coordination with the Bite Size Tags dies (sold separately) to create endless tags for all of your favorite treats. You can mix and match the cute phrases with the versatile images and frames. All of the bold words have a second dotted layer to stamp on top for that extra special detail. Fantastic when tied to any of our sweet treat die-cut boxes and bags! We've got a perfect way to package up small treats and gifts, and with only two passes through your die machine! This new box is easy to assembled and allows for lots of ways to embellish it! Use in conjunction with the Too Hot to Handle or Bite Size Tags. I think now of my favorite things about the Bite Size Tags dies is the small reinforcement tabs that are includes. That little pop of color adds such a nice, professional looking finished detail. Not to mention it also serves the function of helping the twine from ripping through the tag. Laure always has such a way with adding beautiful layers but not making things too fussy. You can see how she took full advantage of the embossed center of the scalloped frame, allowing the stamped dotted frame and apple to tuck nicely into that space. Aren't these just the sweetest? I love how Laurie used the width of the new Truffle Tote Box to the fullest with a long narrow label that fits three pieces of fruit. The fruit in this set has such a bold clean look to it, ink blending works beautifully with it. This design is such a good basic that you could do in all kinds of pretty color schemes based on the season or the recipient. I love that Stephanie broke up all of the symmetry with the rolling pin wrapped in twine. It is a nice visual surprise! The Too Hot to Handle set is just begging to paired up with gingham which Stephanie did flawlessly here. I love how fun the hanging kitchen tools are as well. It is something easy to do, but adds a bit of whimsy to the project. The casual layers and the heart doily on this project are just wonderful. The way the twine appears to be holding everything in place is such a nice design detail. Adding the sentiment to a small tag was a clever way to incorporate it without it getting lost in the mix. I hope you have enjoyed all the creations that I have shared with you today! Did we tell you these new stamps and dies were sweet or what?! Which items caught your eye the most today? Do you give homemade treats out yourself? Will you be using some of these new items on gifts from your kitchen? We would love to hear your initial thoughts on everything we introduced! Please leave a comment on this post to tell us what you think of the new products and you will be eligible to win big! You have until 7am EST, August 14 to leave your comment and be eligible to win. Only one comment per person please. One randomly selected winner will be announced on our August Release Winners Page before noon ET the same day. Thank you for stopping by today and best of luck with the contest! Very cute ideas & products! Just in time for all our fall baking & canning.Love these new goodies!! Love the truffle box and the apple and pear images are terrific. Cheers. Awesome release as usual! I want everything. ? And you got me – Bite Size Tags have done me in for the month! Total love, amazing projects. Bite Size and Too Hot to Handle are so cute! So many different ideas and ways to use them. August PTI is too hot to handle! I am enjoying the bite size tags! I’m a sucker for tags! These small ones are sure to fit in somewhere. Love the new truffle tote box and bite size tags!! This is a great size box. And the too hot to handle is so fun! What a yummy little tag set, love the new dies, too! These ideas are so lovely for little gifts – especially the truffle tote box! Using the truffle tote and pretty tags is a perfect way to get ready for the holidays and share something from my kitchen. Love the classic kitchen look of this set! The Bite Size Tags are so cute. bite sized tags look like a little bit of perfection! love the projects today ladies! I love all things kitchen! That stamp set is perfect! The little oven mitt in “Too Hot To Handle” and the Bite Size apple and pear Tags caught my eye today. Lovely new favor box! And one can’t go wrong with prettily packaged food gifts! Very excited to add these sets to my crafting arsenal! What a great idea the stamp sets introduced today! Always looking for ways to dress up food gifts. All things kitchen is so cute! I love the oven mitts and rolling pin! You can never have too many tags. Love the sweet little size of these! Love the time too hot to handle set! What a great set of images! Knocked it out of the park again! How fun! The new Bite Size Tags & little boxes are super cute! The tags and die set are absolutely adorable. I have an older holiday set that I use every year. I also love the treat box. What fun new products and lovely inspiration! Love the Too Hot to Handle! Your design team is amazing! 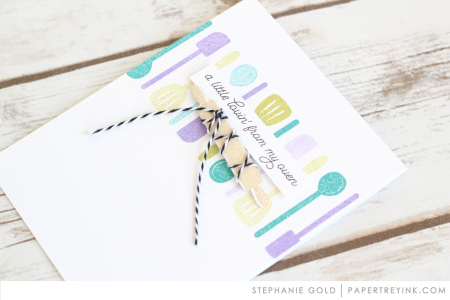 The new stamps make perfect cards for food gifts! PTI always designs the most unique and adorable gift boxes. Love the little truffle box- so sweet! As a baker these are calling out to me! Especially love the bite size tags and truffle box. Cute set! I love the cards Stephanie made. Tags are so fun to make!! The box is a nice size!! Loving all the DT’s projects today. So adorable! Another Awesome day, love, love, love! Too Hot To Handle is just that! Love It! Sweet little tags and cute baking set! Excited to see more of that. Pluse a lovey corn card from Betsy today! Oven Mitts? LOVE! Crushing on all things baking. Love the new treat box and tag too! So sweet!!! Love the Truffle Box!!! It’ll make perfect packaging! I love Too Hot to Handle! Such cute little utensils!! Too hot to handle looks great for making cards or tags for homemade treats. I love that you can use it all year round. And I love that truffle box! The two of these paired together would be awesome! Another fun round of ideas! I’m a total sucker for treat bags and I absolutely love the sweet little gift boxes! Beautiful tags and packaging! Love the truffle box and window options! Bite size tags are too adorable! Such delightful and adorable projects, lovely stamping ideas!! Love the Truffle Tote Box and all the tag ideas! I bake for the holidays to share with friends and neighbors, so all of these would add a special touch to the baked gifts give! Those truffle boxes are the cutest! It would be so much fun to give my friends treats in such cute packaging. Love that truffle box! Everyone’s projects are so cute! These new stamps and dies are fabulous! I can definitely use the Truffle box. I will make several to use as a gift when I go visit someone, or as a little house warming gift. Too Hot to Handle will be great for food/snacks gifts for the holidays. My wonderful neighbor always brings me baked goods and food dishes. I’d love to make her some belly bands, and tags. Cute stuff today! Especially the tags and tote box. The tags and truffle boxes are adorable and so versatile. The Too Hot to Handle and the tag set are adorable! I love the corn and the scarecrow. Lots of people hang that corn up on their doors. That´s my release day!!! I realy like the Bite Size Tags and the lovely new favor box! And I also need the set Too Hot To Handle!!! My favorite is the Truffle Tote Box. The tags are really wonderful too. Love the bite size tags and the Too Hot to Handle sets…great versatility! Very cute new stamp sets and projects today! Great for farmers market items!! Totally loving the truffle tote and the bite size tags! Oh, those bite size tags are amazing… so cute and sweet! Love the fruits. I don’t have a lot of tags…these may just fill the void! Love, love, love!!! Too Hot To Handle and Truffle Tote Box Dies are my fav!!! Love these new amazing products!!! They will be mine!!! I love baking biscuits or cakes and give them to my friends and these cuties would be perfect to create adorable boxes where put them in together with beautiful cards!!! I am a container-a-holic so I LOVE the Truffle box…the tags, too! Aaack! More fruit! Love it! I can practically hear it jumping into my cart. Fabulous samples today! Love those sweet little tags! Super cute!! And I love that these sets can be used all year long!! What a Great release!! Bite Size and Too Hot to Handle are both so perfect for upcoming holiday gifts and Fall baking, that warms the kitchen. Great inspiration by the design team, as well. What fun projects! I love to bake and give food gifts, so can’t wait to see more of Too Hot to Handle! Love the bite size tags. Perfect for this time of year. I always think you can’t add anything new that I want or need but I’m so wrong! I’m following more in love with that scarecrow too! That truffle tote is so cute and I love the bite size tags! Awesome new products today. Definitely on my wish list. What a wonderful collection of products for gifting hand-made goodies! I love the new truffle box die – it’s going to be perfect for giving neighbor treats. I really like the Bite Size Tags with Just a Little Something. What fun! Love the bite sized tags! So cute! I love the kitchen stamps. So cute. Great samples today. 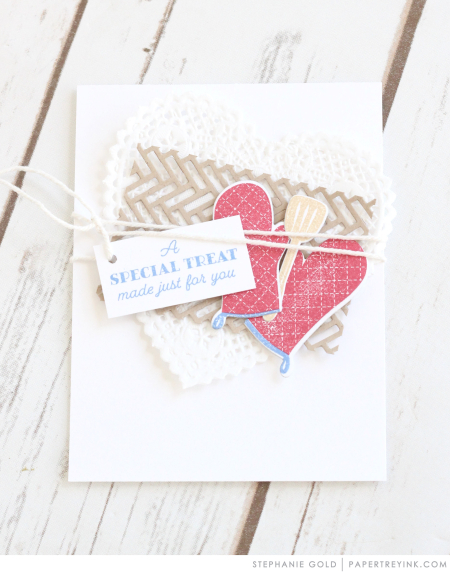 LOVE today’s reveal of new stamps and dies! As one who gifts food regularly, these sets will probably never leave my craft table. Thanks for the amazing designs, they complement each other so well, something PTI does so well. Always fun to dress up homemade goodies! I really love the cute new tags! Love everything! I make candy for Christmas treats and I’m eyeing those Bite Size Tags. Beautiful projects and colors! Such sweet ideas for gift giving! That new Truffle Tote box is adorable! Beautiful inspiration, love all the new products!!! Too hot to Handle is too cute! 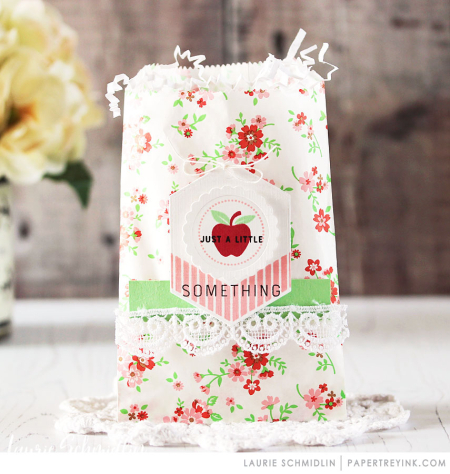 Those little tags are perfect for homemade goodies! I just love this whole idea. Those oven mitts are so cute, they would be awesome added to a recipe card too! Great release day! 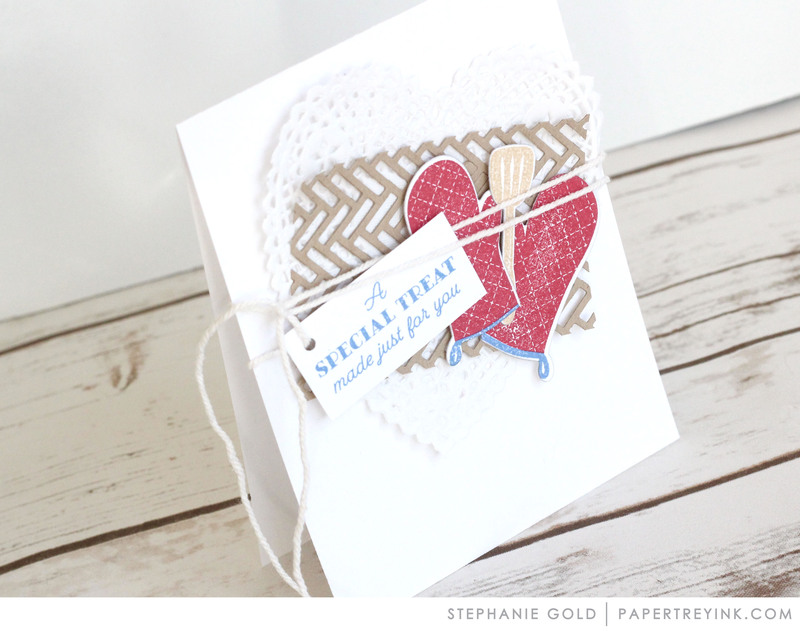 Love the new tags and box – super cute with those stamp sets! Love the tags and truffle box! I give treats and homemade goodies for gifts and favors often. These would be great to add to my collection! Very cute ideas and love those bite size tags! Such a fun release with the rolling pin and oven mitts, too. Excited for more tags! I simply can’t get enough of them! I probably make way more tags than cards. Those bite sized tags are perfect! The oven mit is adorable! cute products today… I really love the way Stephanie showcased the products. she always brings a lovely whimsy to everything she creates! Love the Too Hot to Handle and Truffle Box! I bake treats for people frequently. Too Hot to Handle and Bite Size Tags will be great sets to use. Love them! 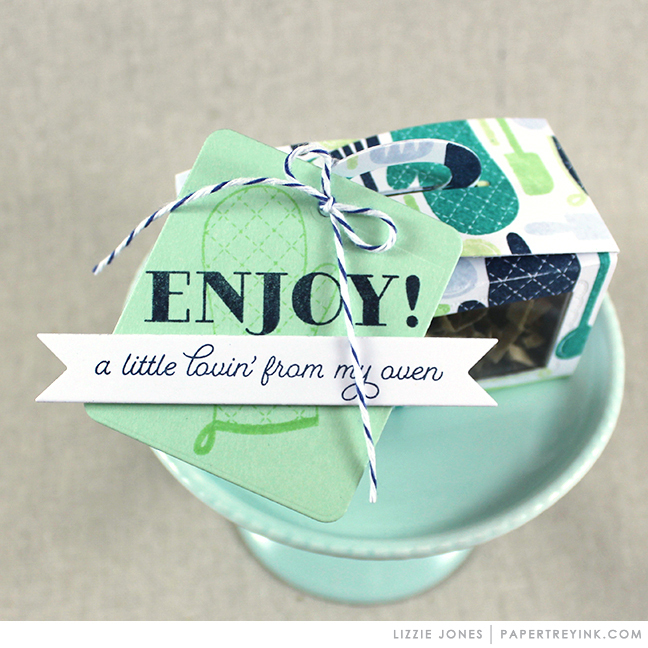 Love that sweet box….so perfect for sweet little gifts! Clever use of the Mix & Mat: herringbone. It has the look of a cookie cooling rack! So happy to see packaging and tag products along with the baking theme stamps!! Love- Too Hot to Handle!!! Cute, cute, cute! Love these new additions today! Love that truffle box! Cute products today … thanks for sharing, PTI Design Team! Sweet tags and gift boxes!! So cute!! Great projects! The little tags are really cute! Too Hot to Handle little kitchen tools are so fun! Kitchen, baking, tags, lovin from the oven….o.m.g. The bite size tags with stamps and truffle box make giving homemade goodies very special. The recipient will be thrilled. Too hot to handle is perfect for scrapbook pages featuring holiday meals or teaching kids how to cook. New tags are always fun, and Too Hot to Handle is a great new addition! Love these! Perfect for adding to home-made gifts from the kitchen. Too Hot To Handle is a great addition..and such a fun play on words. Love all the clever package ideas.. Very yummy projects! Perfect for Thanksgiving decoration and cards! Great packaging and fun tags! Love the little tag and truffle box! What a great release – luv all those awesome tags and other projects. I love the Bite Sized tags. I’ve taken to making many tags at once so I will have them on hand. These will be fun to put together. And along with Too Hot to Handle and the favor box I will be inspired to make and package food gifts this year. I like the unique shape to the tags and the foodie stamps! Gorgeous creations!!! Love the little tangles and the too hot to handle stamps!! Love the truffle treat box and the new tag set! Wonderful projects today! Hmmm, I may have to start making goodies for friends and neighbors just so I can use the cute Too Hot to Handle set and those cute tags! Everything here looks like something I would really use. You outdo yourselves again! The new truffle tote box die is darling. Can’t wait to see more projects using it! Loving all the little tags too. Delightful–so many ways to decorate gift packages! The new truffle box is absolutely adorable! It’s such a cutie. The little handle on top just puts this must-have box over the top! Still liking everything, you’re on a roll… Looking forward to seeing it all. Thank you! I love these little delights to add to baked goods, or meals for others anytime! Thanks for keeping them suitable for any season….changes in ink, paper, and tiny embellishments make them work year round! Love the too hot to handle set!!! Just perfect! The treat box is adorable also! I LOVE this release! It is going to be impossible to choose my favorites. Oh, these are all adorable! I like to make tags to give my friends who bake, cook and can, so they have cute tags to use, and these are all perfect. Loving the kitchen related items! Great for those foodie gifts! So sweet!! 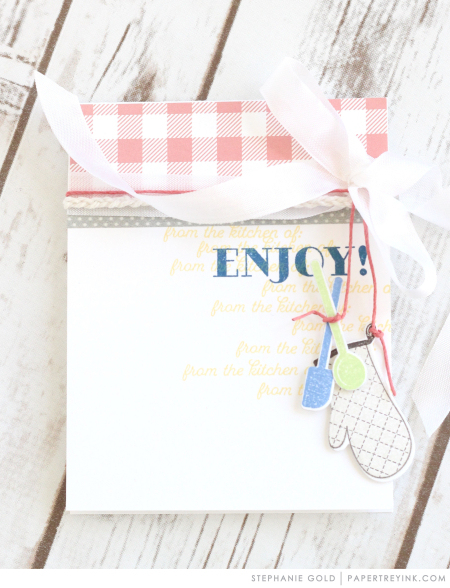 These stamps and dies are just perfect for sharing handmade kindness from the kitchen. I truly love sharing treats from our kitchen with family and friends. It’s fun to surprise our neighbors with sweet ‘thank yous’ each time they help us with our leaves or the snow. Autumn baking days are just around the corner! Love the inspiration from the talented Papertrey design team! ? I am loving all of the new releases. What fun each day to see the fantastic new things. So many great choices. The tiny baking utensils are so very cute!! These will be so much fun to play with. Really cute packaging and gift tag ideas for “homemade from the kitchen” gifts. Wonderful samples from your Team per usual. The Too Hot to Handle set is so cute. Love the little oven mitts! 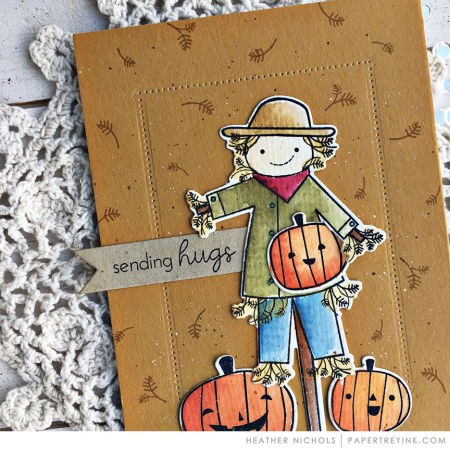 I especially like the corn stamp set and scarecrow featured at the end of today’s blog post. Oh my goodness, I have all the veggie and fruit sets and Too Hot to Handle would be amazing to have to go with those! The small Tote Boxes are I know are going to come in handy for all occasions, love them. The Bite Size Tags are a clever idea – sometimes a regular sized tag is just too big. I love the colorful reinforcements, too. Loving the bite size tags. Great projects. Love the “Too Hot to Handle” set. I have always been attracted to stamps that can be used to show off my kitchen creations! I am in love with that adorable truffle box! To hot to handle will be perfect for all the yummy fall goodies everyone will be making soon! The Too hot to handle set is so darn cute! I love all the tags and gift ideas. Personal gift items are the best! 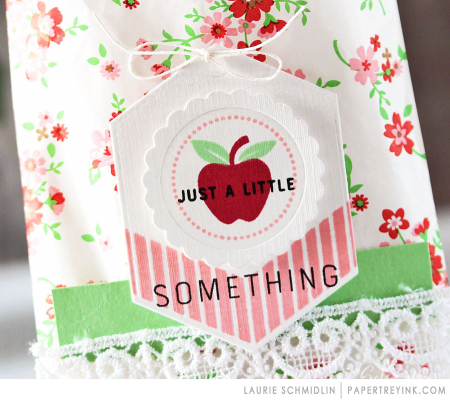 Such sweet little tags and cute little cut outs! I love the classic look of the fruits and how pretty they look blended with ink! The tiny little baking items are just adorable! Everything just ties in together beautifully. Cute products for treats and gifts!! Love the Bite Size Tags!!! 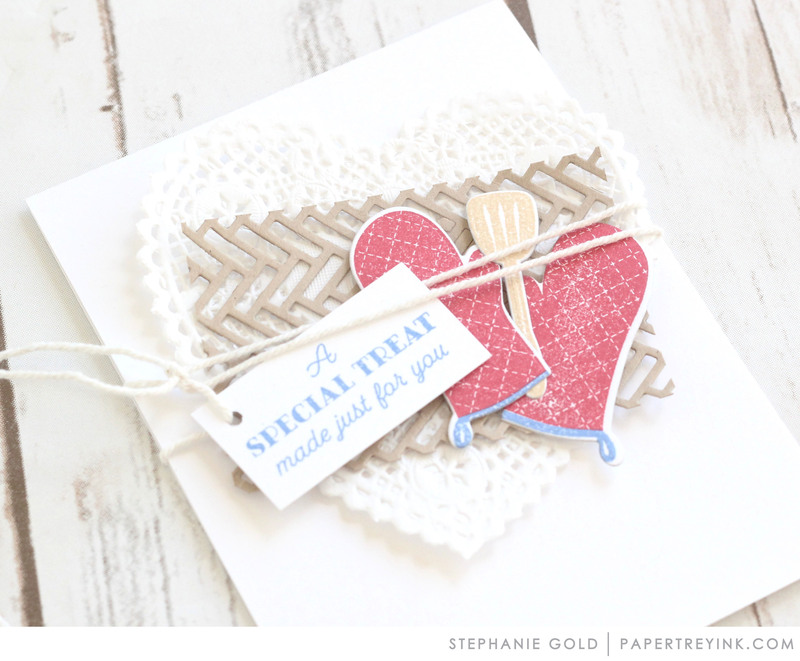 As someone who loves to gift homemade treats, these stamps and tags are a BIG must have!!! Love the Corn, Scarecrow and tags along with all the other great items. I’m addicted to little boxes and I love that new truffle box! And anything with tags… on My! Darling! Love all the cute kitchen designs and ways to “treat” our friends and family. 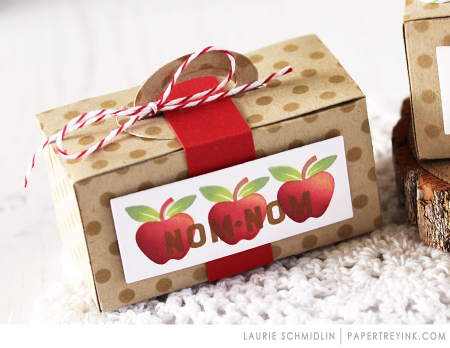 I love boxes for homemade treats and this one is fabulous. Fabulous inspiration for fall cards and projects. I love all things cooking themed and these are no exception. I want to bake just so I can package them so cute. Too Hot To Handle and Halloween Hugs are absolutely adorable! Definite must-haves! Great release! My wishlist just keeps getting bigger! 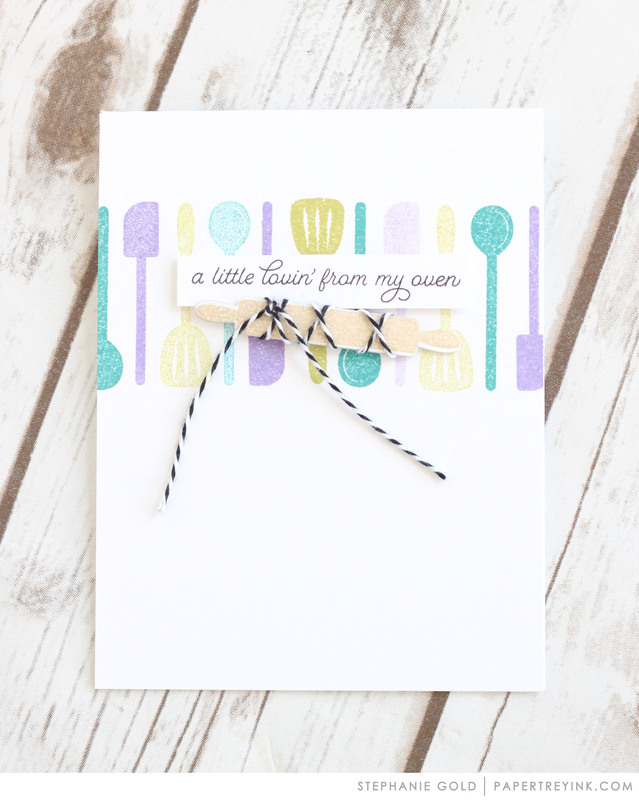 Some cute stamps and dies for those that are creative in the kitchen, too. Oh! The truffle tote box is too adorable and could be used for so many lovely things! So many cute new products and ideas! Such an awesome month of releases! Love the Too Hot To Handle set! The kitchen items are really cute, especially paired with gingham! Super cute inspiration today! Love it all!!! Beautiful samples… Makes me want to get in my kitchen & bake! Love the cute stamps & dies! I love Heather Nichol’s scarecrow card! Must get that stamp and have some fun with it! Love too hot to handle set. Love all your tips too. I love bite sized tags. Fabulous projects today! So cute! Love the Truffle Box and tiny tags, and kitchen utensils are adorable. The little box is so cute along with the kitchen stamps! Such great products today! the bite size tags are adorable. Loving the new cute tags. I love making tags for gifts and love how the team used them in various ways. Super cute tags. Wow, and wonderful inspiration too. 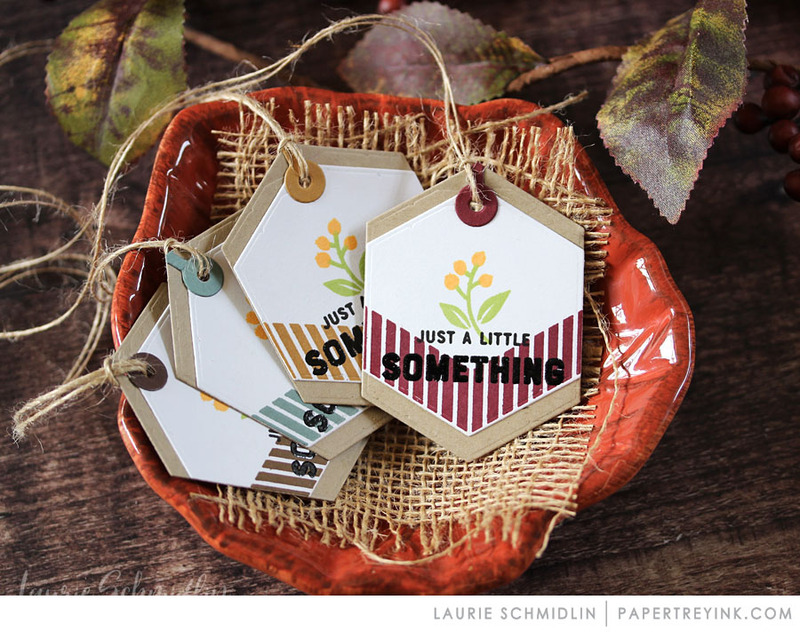 Both Too Hot To Handle and Bite Size Tags are going to be great for the upcoming holiday stamping. Can’t wait to add those to my cart! Love all kinds of packaging, boxes and bags, so the truffle box die is calling my name! 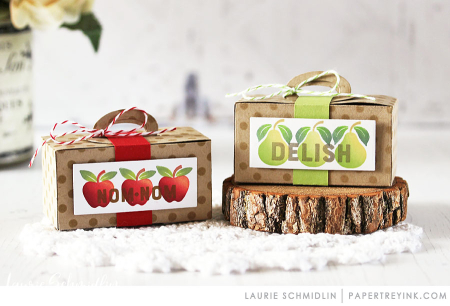 These adorable packages and tags can be used year round to create custom packaging for all occasions. Thanks to the DT for sharing all of the beautiful and inspirational projects. Too hot to handle and bite sized tags are fabulous. Perfect for food gifts! Everything today is so cute! The tags and the kitchen images are just adorable! Too Hot to Handle is just adorable and perfect for my edible gift giving, one more add to the list. Such cute tags and tote boxes! Love what everybody has made with them. Love these sets – so many uses. The little tags are another must have and the kitchen set is very tempting! Love the Bite Size Tags. Cute projects! 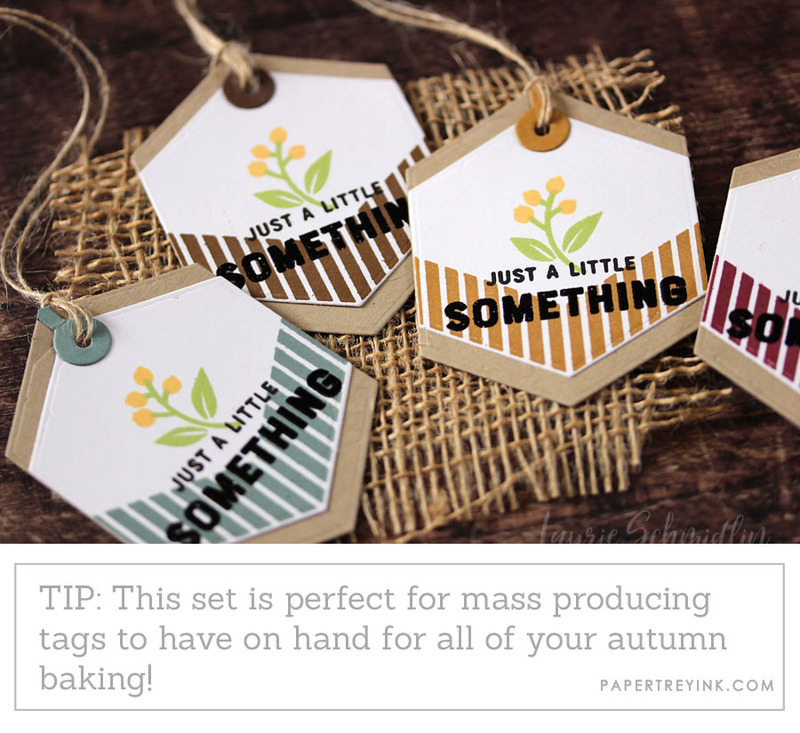 Awesome little tags and baking tools. Loving it all! Cute ideas for all those tasty gifts!! Love the tags and the favor box! So much to love in this release! What a adorable set of stamps! It would be fun to use them to make a family recipe book. The tags are so Cute!!! Another new release knocked out of the park!!! Oh I LOVE the new little boxes, the Lovin from the oven and the boxes!! Totally fabulous!! I love giving food gifts and these little elements ROCK!! Cute projects! The Truffle Box die looks to be just the right size for school treats. I love bite size tags! The stamps and dies tigether are awesome! What a great practical set of products. Love the cute images in the Too Hot to Handle stamp set! The too hot to handle kit sounds awesome! I love the idea of enhanced packaging for gifted baked goods. Another A++ release day for PTI. Every item is on my wish list. I’m so jazzed for this August release! Love those cute little tags! Lovely gift packaging ideas. Neat products! I give lots of gifts of food, these will be great! The bite size tags are too cute along with the truffle tote box. I love making homemade tags to go on homemade treats, so this post is right up my alley. Love all the tags. I love the kitchen inspired stamps and dies. They are so cute. What fun! Love the new baking set. Wonderful projects for our baking projects – super cute! And more of that adorable scarecrow! I’m in love! The all things kitchen set it adorable. I have added it to my wish list. Oh, I’m so excited about Too Hot to Handle! I design kitchens and this set will be perfect to make thank you cards for my clients! This is right up my alley! 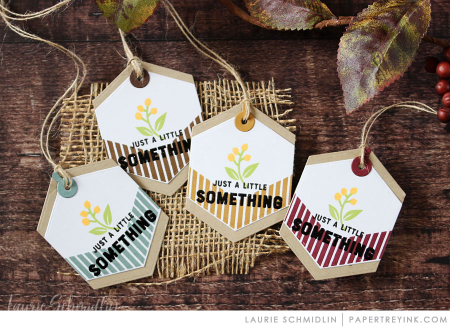 Love how you can use these cute little stamps on tags. I love the bite-size tags. Like the Bite Size tags and the darling samples that Laurie made. So many wonderful options to include with home made goodies! The kitchen set is so cute! Love the utensils. The tags are so cute. Love all if this. Tags are so fun! I love making them! Love the fruit images in this set also. Love the shape of the tags – so pretty and different! I love these projects. The truffle box is so great. I need that one! Cute kitchen collection….just love those adorable oven mits! Great DT projects today! Love all of it. Lots of great design ideas. Can’t wait! Decorating baked goods to give is just as much fun as the baking! So cute! I love the baking set, and those sweet tags! 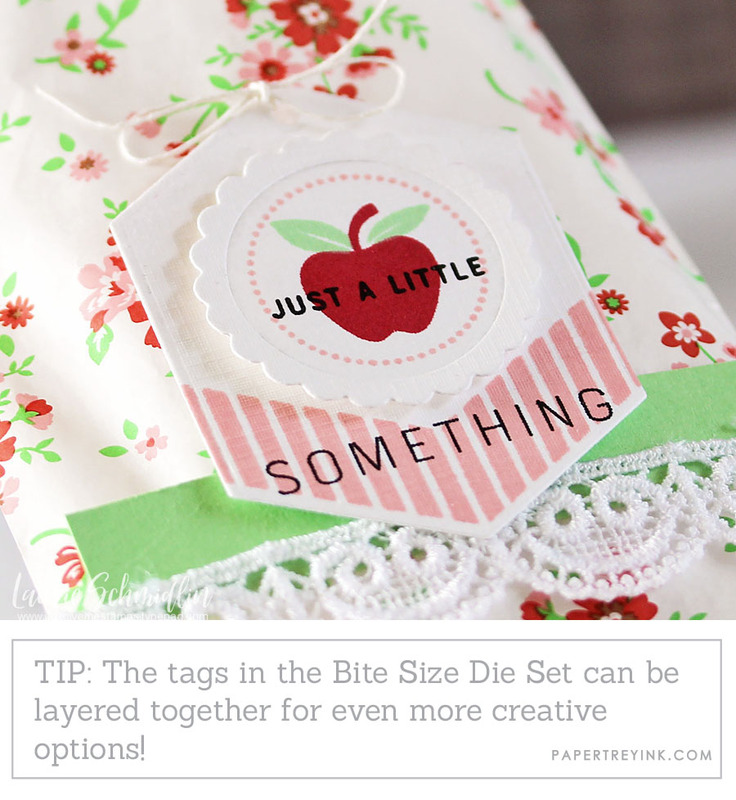 Love the Bite Sized tag dies….so cute! I’m always looking for new treat boxes; love the truffle box. Great release; looking forward to more. Very handy sets for bakers today. Wish I did more of that, just never enough time in the day. Love those “bite size” tags! Bite Size and Too Hot to Handle are just so versatile. And the little truffle box is too cute! Too hot to handle is filled with the most adorable images, such a sweet to embellish a package of home made goodness. Love the Bite Size tags too, perfect size for small gifts. Food gifts are always popular so things for packaging always come in handy. I love fall, too! So this release makes me HAPPY! The Bite Size Stamp set and dies and the Truffle Box Dies are just what I need for canned jelly and gift giving. And I love the tip on how to add highlights and shadows to solid image stamps! I adore all of the baking-themed items in today’s release sneak. I think the truffle box is adorable, and I love the bite-sized tags. Love the new tag and unique shape! Great release! Sweet little truffle box that would be excellent for lots of goodies! Halloween colors is what I am thinking. 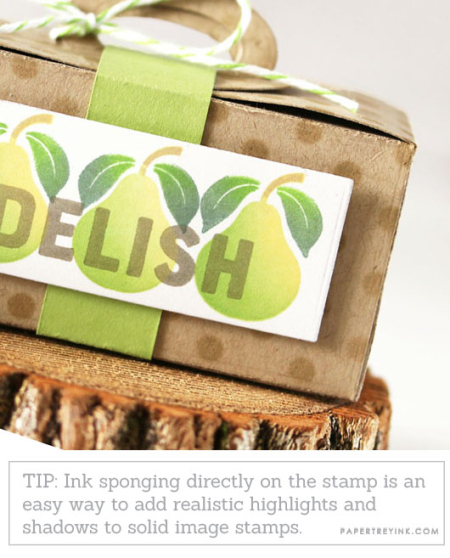 I also love the apple and pear stamps-simple and clean with so many uses. Super cute kitchen themed stamps! Oh man, I love everything from today! 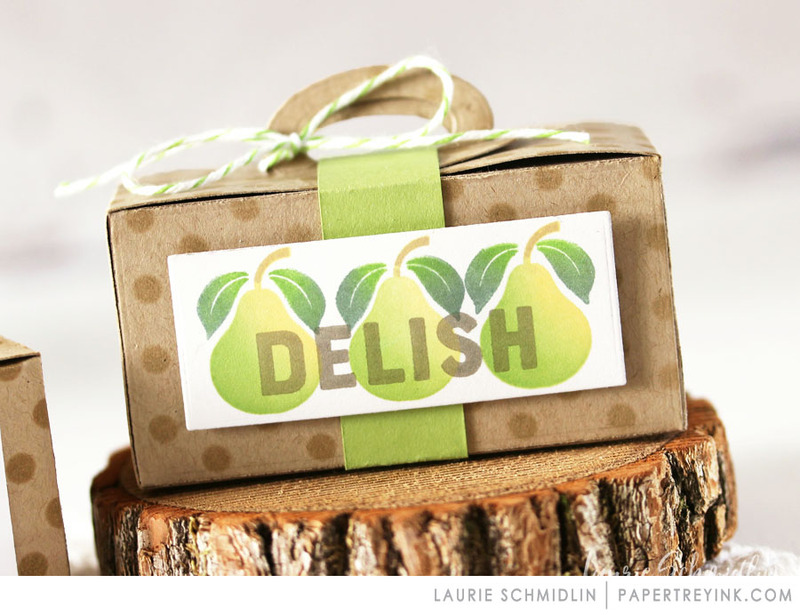 I love the fruit and kitchen images – perfect for fun/cute tags for gift giving homemade foods. Such cute packaging! Love the tags! As the unofficial “family baker” the Too Hot to Handle set speaks to me. So cute. Love the Truffle Tote Box too. Beautiful projects. Love all the items shown today. The box and tiny tags are super cute. Love everything the design team came up with. I love the Too Hot To Handle stamps and dies!!! Too cute! Beautiful fall inspiration. I can’t wait for the season to arrive. Love today’s release introductions and inspiration. Great release! I can see Too Hot to Handle being a go-to for homemade Christmas treats. Lots of fun gift ideas today. Too Hot to Handle!!! PTI is smokin’ hot this month. Those bite size tags are too adorable! I love Too Hot to Handle–I like giving gifts of baked goods, it should be perfect! I love the bit size tags. Wonderful new release with delightful design team projects!! Thank you all for such a treat and so much inspiration!! I like the modern twist of using current sayings for the Bite Size tags! Great, inspiring ideas, too! I especially love Betsy’s corn card! I need everything from todays peeks. 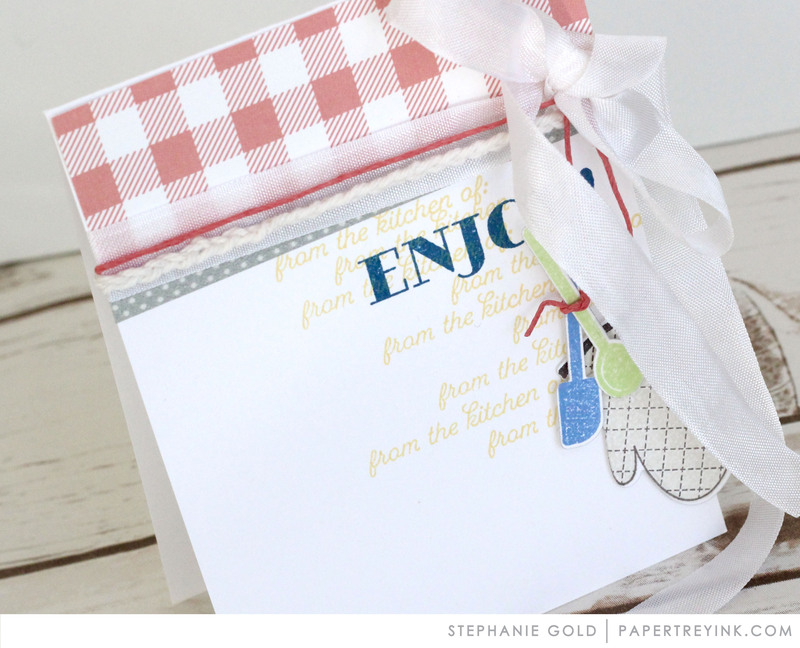 I decorate recipe cards so I am excited to see the rest of the images. Love the bite size tags and the truffle box, will surely come in handy this holiday season! I am so excited about the too hot to handle sets, perfect for gift tags and recipe cards/recipe books! Too Hot to Handle is a fabulous set! So many adorable items this month! Love love them all! The bite size tags are adorable! Love making tags! So many cute things today (and everyday)!!! Love the Tote box and Too Hot to Handle set. Perfect for homemade treats for the holidays. Ooh I absolutely adore Too Hot To Handle stamps and dies! I love cooking/baking and giving homemade baked goods to family and friends. I see myself using this set over and over! Super creative ideas and inspiration from everyone today! Too Hot To Handle is great! I’ve been looking for a good kitchen set. Love all the pretty packaging for the baked goods! That treat box is super cute! Very cute ideas! Love everything! All the kitchen themed products are really cute! 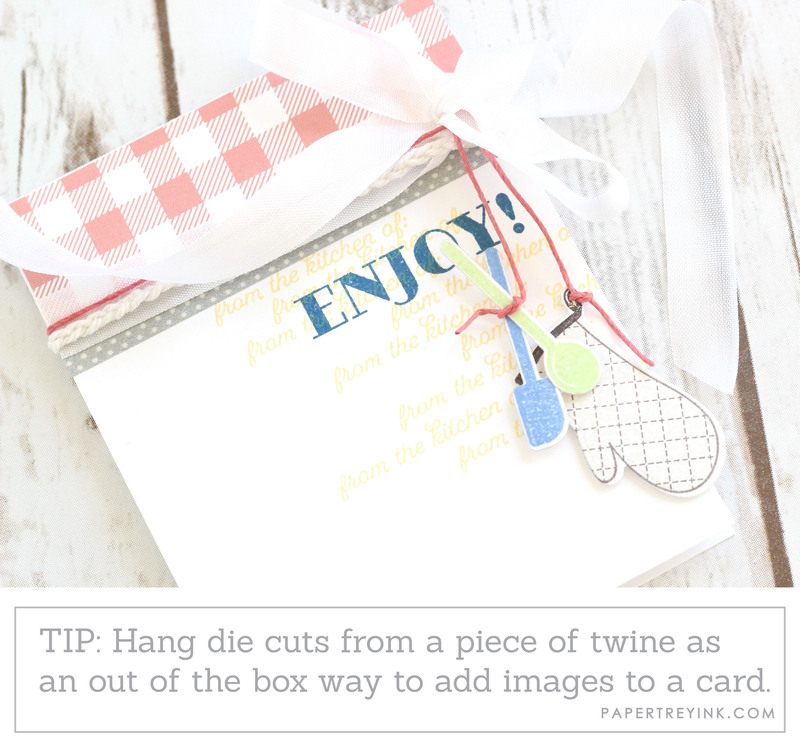 I am always looking for easy ways to package little treats and gift cards at xmas time. The new Truffle Box is perfect and can be used for lots of different celebrations along with the tags. What charmingly delightful projects today! Love the Bite Size Tags! I do give out homemade treats and the Bite Size Tags have caught my eye. I believe I’ll be adding them to my wish list. Thanks! hmm..i’d love to RECEIVE yummy treats in these. LOL! Great products for home made gifts. Thanks for all the inspiration! 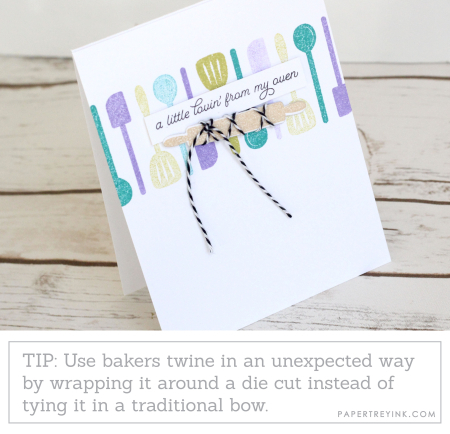 Oh how I love the bakin stamps–and just in time for baking season to begin! The oven mitts are the cutest thing ever!! The little gift box is perfect! The Truffle Box and the Bite Size Tags are so cute! The food ideas are great! I like possibilities with the new kitchen stamp set, not a lot of those available so this is a neat set! Sweet little tags! Too Hot to Handle is a great set for using with baked goods and food gifts. Both of these are really cute sets and should be lots of fun to use! I love the tag dies & Too Hot To Handle! Can’t wait to see more! Anyone else want to hit the kitchen and start baking? What sweet sets today! Love them all! You are getting me in the mood for fall. So many cute projects! Too Hot to Handle is so cute! Love the tags and Too Hot to Handle – just in time for the fast-approaching baking season! What a cute baking set! Love the little tags! Such pretty cards and projects again today! Thanks for sharing the creativity! My neighbor reminds me to bring over goodies on throw away plates because she is not very good at returning containers. These are great ideas for jazzing up throw away plates! Oh how cute are those Oven Mitts! Lovin all the stamps,dies, treat box and tags for bakery gifts! The tags and boxes are sweet! Really cute stuff this month! The kitchen set is too cute! Also loving the truffle box! Those bite-size tags are adorable!! I do a lot of baking around this time of the year and those tags and Too Hot to Handle stamps and dies are perfect! This release is looking very costly, lots and lots of things I want and it’s only day 4 . I know a baker and card maker who’d love a set of the Too Hot to Handke stamps! What fun! Too Hot To Handle and Bite Size are two cute stamp sets! Love the new dies too. Another great release, PTI! I love packaging gifts in bitty bags and bitty tags will be a perfect addition. Thanks for another great day of inspiration! Really cute stamp &dies for people like me who like to give gifts from the kitchen.Love it.Can’t wait for the full release. Wonderful selections today! Love all the fantastic creations! Love the Bite Size tags! I love Too Hot to Handle – cute name for a very cute set! Loved the Bite Size Tags! The layering technique just adds that special touch to the project; a perfect compliment to a homemade gift. Those tags are SO sweet and the tote boxes are darling! Too hotto handle looke like a must have for me (a big fan of homemade food gifts). Great ideas for yummy homemade gifts. I love the tags! Perfect packaging ideas for some fall baked goods! Love all things that have to do with baking! I love these tags. So darling. So many opportunities to use them. Love it. Great release. Everything in today’s release is a must have. Who wouldn’t love getting treats wrapped up in adorable packaging made with these amazing products? No one I know, that’s for sure. Cute samples today. I especially enjoyed the pear and apple images! The new fruit is cute. I love the tags!!! 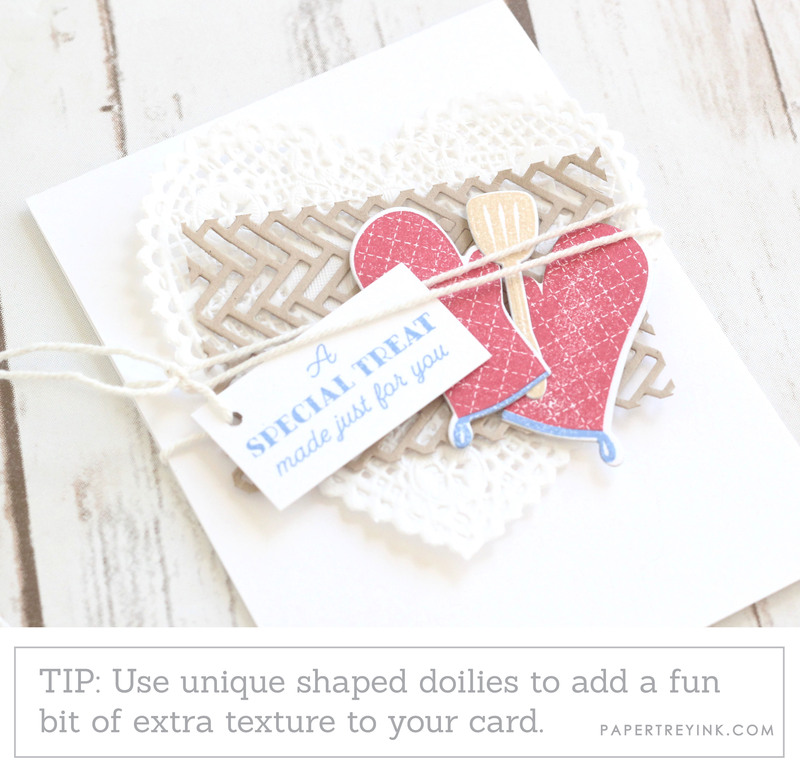 The scalloped die with the debossed center is adorable. Its all fabulous….especially the favor box! I love the new favor box!! Those tiny tags are adorable too, and perfect to tie on the new treat box!! The fruit stamps are amazing! Love the Truffle Tote Box! Oh my word! I just love those sweet little tags and the box die! And the stamp set is perfect with those oven mitts! Cute Cute projects! Those little bon bon boxes are so sweet and the tags are so fun. Food gifts are the best! Great inspiration, today. I love all the ways to dress up homemade goodies. Truffle boxes are so cute! I like the tags too. Those little tags are adorable!! So perfect for giving away baked goods. Yay! So much to love! I’m not even a super big patterned paper user, but I totally love these! I really like the Too Hot to handle set. I can’t wait till the holiday baking season, this set will be just perfect. Too Hot to Handle and the cutest tags ever are perfect for making gifts.